In a large bowl, add the shrimp and all the chopped ingredients together. After mixing, add-in the remaining ingredients and cover the bowl with plastic wrap. Refrigerate the mixture for at least 40 minutes to allow the flavors to combine. 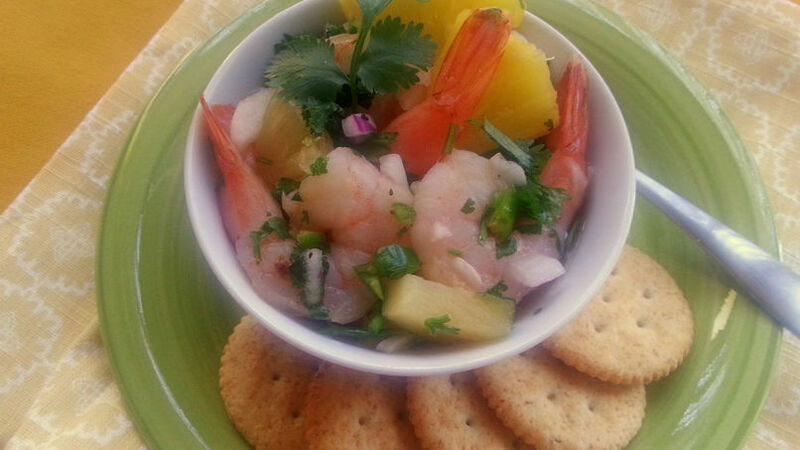 Garnish the ceviche with pineapple wedges and serve with saltine crackers. When cooking shrimp, it’s recommended to steam them for a few minutes until pink in color. You can also use pre-cooked, frozen shrimp in this recipe. Ceviche is a fresh and easy appetizer to make. Popular in Peru and also Mexico, ceviche is well-known in coastal regions due to the abundance of seafood and fish. The recipe that I’ll share with you today is a little different than the typical ceviche, as it combines sweet and salty sabores to form a balanced and delicious dish. Let’s get cooking!